Hello everyone! How was your Thanksgiving? I hope everyone stuffed themselves till they couldn’t breathe, well I definitely did that. This was the first time that I attended a Thanksgiving dinner and oh my god there was so much food! It was crazy and I ate so much that I think have had enough for days! So after eating way too many treats, I had to put up a healthy recipe. 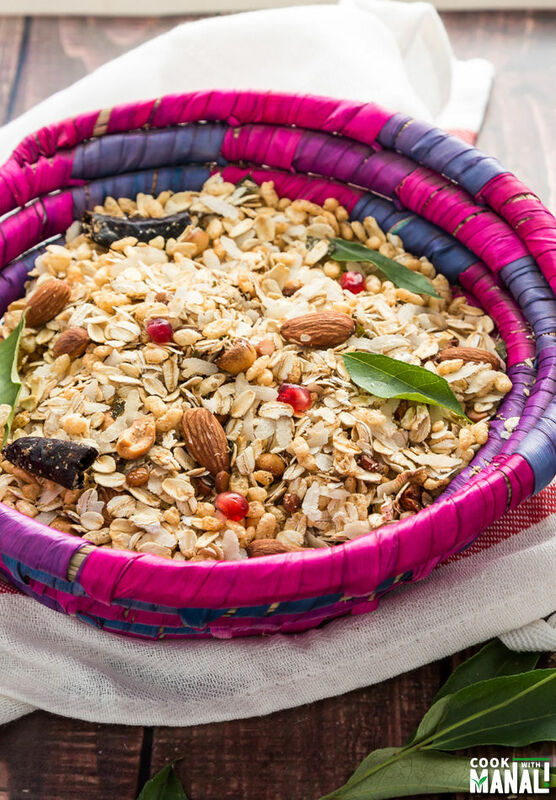 This Indian style oats snack mix is perfect when you want to munch on something light and healthy. 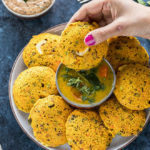 “Chivda” is the term used for a popular savory tea time snack in India. It’s basically puffed rice, peanuts, some lentils, nuts and other spices. Everything is pan fried and then mixed together. It’s light and something you can munch on without any guilt [in moderate amount of course]. The idea for making this oats chivda came to me because I crave to eat something savory with my chai and recently I noticed that I was eating a lot of junk just because I just didn’t have anything healthy to munch on especially during evening and so I made this. I pan fried everything in little oil and replaced puffed rice with oats. This vegan chivda has oats, poha (flattened rice), rice krispies, lentils, curry leaves, peanuts, almonds, dried red chili, shredded coconut and some spices. 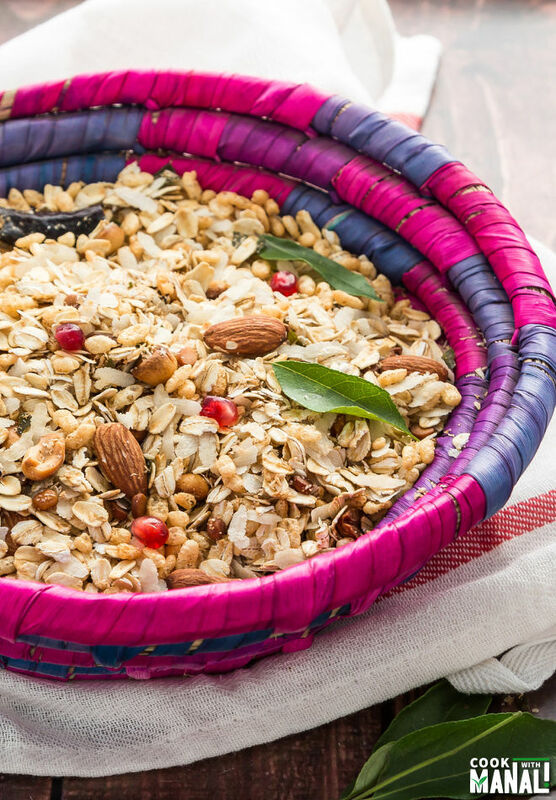 Hope you give this healthy Indian style oats snack mix a try. It’s vegan, easy to make, healthy and totally good to munch on! Place oats, almonds, poha (flattened rice) and rise krispies on a baking mat. Roast till nicely fragrant, around 15 minutes. Transfer mixture to a bowl and set aside. Heat 2 teaspoons of oil on medium heat. Once the oil is hot, add the chana dal (split garbanzo bean). Fry the dal till it’s golden brown in color. Drain on a paper towel. In the same pan, now add curry leaves and whole dried red chili (broken). Cook till curry leaves turn crisp, 1-2 minutes. Drain curry leaves and whole dried red chili on paper towel. Now in the same pan, add peanuts. Saute till peanuts are golden brown in color and drain on a paper towel. Add coconut to the same pan and saute till fragrant and light golden in color. Drain on a paper towel. Now take the oats mixture and add all the things that you fried into it – peanuts, lentils, curry leaves, coconut, and dried red chili. Add salt, sugar, cinnamon powder and chaat masala (optional) and mix. The healthy oats tea time mix is now ready to eat. 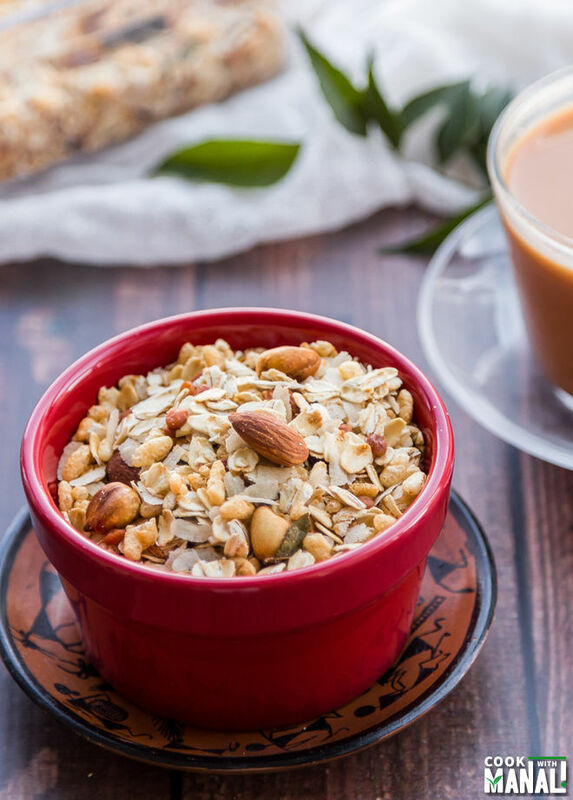 Store in an airtight container and enjoy this oats poha chivda with cup of hot chai. * You can add any nuts, lentils, raisins, cereals of your choice to this mix. * The oats can be roasted in a pan on medium heat till they turn light golden brown in color. 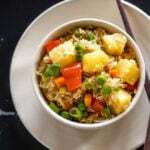 * If you don’t have rice krispies, simply remove them from the recipe or replace equal amount with poha or some cereal. 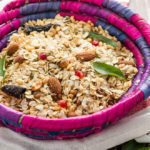 Healthy tea time Indian style snack mix with Oats, Flattened Rice & Nuts. Heat 2 teaspoons of oil on medium heat. 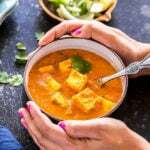 Once the oil is hot, add the chana dal. Fry the dal till it's golden brown in color. Drain on a paper towel. Now in the same pan, add peanuts and saute till golden brown in color and drain on a paper towel. Now take the oats mixture and add all the things that you fried into it - peanuts, lentils, curry leaves, coconut, and dried red chili. Store in an airtight container and enjoy with a cup of chai. Glad you like it Mira! We love oat snacks! This looks right up my alley, Manali. Glad you had a good Thanksgiving!! 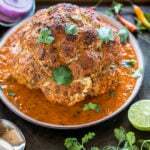 This looks so good, I’ve never heard of chivda before but I definitely want to try it. Pinned! Never seen a recipe like this before! Definitely something delicious I can see myself snacking on and adding possibly to my morning breakfast yoghurt? That’s a good idea Thalia, I think it will taste good with yogurt! LOVE chivda! Yours looks fantastic. I’m loving that bowl, too! So festive and bright. Thanks Sarah! Surprised you know what Chivda is!! I love anything with oats and the puffed rice and lentils sounds fabulous in here! Can’t wait to give this a try! This sounds dreamy!! I love the sounds of the flavors together and the different types of grains! Thanks so much for sharing! I hope you enjoyed your first Thanksgiving!! Yeah, it’s a lot of food, huh? Haha! haha indeed it was a LOT of food! 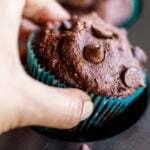 Hope you give this a try! I definitely need this after our holiday meal!! The perfect snack – I would eat it by the handful. But i guess that would defeat the purpose of the healthy snack! Pinned! And your photos are gorgeous as always! I love chivda for snacks and this one is looking great. Definitely oats makes it much healthy. Love the recipe dear !! Super healthy for eating without feeling guilty. Lovely.